Last night in New York City the winners of the National Book Critics Circle Awards (NBCC) were announced. 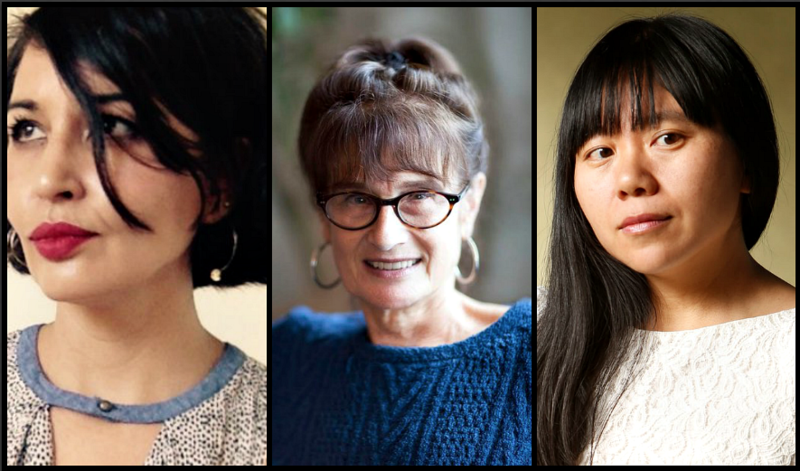 The winners in all six categories were women, including Layli Long Soldier in poetry for her collection, WHEREAS (Graywolf), Joan Silber in fiction for her novel Improvement (Counterpoint), and Xiaolu Guo in autobiography for her memoir, Nine Continents: A Memoir In and Out of China (Grove). The poetry finalists were Nuar Alsadir’s Fourth Person Singular (Oxford University Press), James Longenbach’s Earthling (W.W. Norton), Frank Ormsby’s The Darkness of Snow (Wake Forest University Press), and Ana Ristović’s Directions for Use, translated from the Serbian by Steven Teref and Maja Teref (Zephyr Press). The finalists in fiction were Mohsin Hamid’s Exit West (Riverhead), Alice McDermott’s The Ninth Hour (Farrar, Straus and Giroux), Arundhati Roy’s The Ministry of Utmost Happiness (Knopf), and Jesmyn Ward’s Sing, Unburied, Sing (Scribner). The finalists in autobiography were Thi Bui’s The Best We Could Do: An Illustrated Memoir (Abrams), Roxane Gay’s Hunger: A Memoir of (My) Body (Harper), Henry Marsh’s Admissions: Life as a Brain Surgeon (Thomas Dunne Books/St. Martins), and Ludmilla Petrushevskaya’s The Girl From the Metropol Hotel: Growing Up in Communist Russia, translated from the Russian by Anna Summers (Penguin). Additionally, fiction writer Carmen Maria Machado won the John Leonard Prize for her story collection, Her Body and Other Parties (Graywolf); fiction writer and critic Charles Finch received the Nona Balakian Citation for Excellence in Reviewing; and creative nonfiction writer John McPhee received the Ivan Sandrof Lifetime Achievement Award. Established in 1974, the National Book Critics Circle Awards, which are among the most prestigious prizes for literature, are given annually for books published in the previous year. A board of twenty-four working magazine and newspaper critics and editors nominates and selects the winners each year. Visit the NBCC website for a complete list of winners and finalists.